The legacy of the Chevalier Brothers lives on in the shape of a 2003 CD re-issue on Westside Records of the first album with some previously unreleased live tracks. I have just managed to get my hands on some copies & the album will be available for sale on this site shortly. The first 2 albums have recently been released on a Japanese label too. Both releases feature the bonus live tracks from the UK CD release on Westside Records. If they do well they will also release the third album. The Chevalier Brothers were originally a busking band in London (mainly Portobello Rd & Camden Market) that couldn’t fail to get noticed. As a three piece they won an NME busking competition in the summer of 1982 & decided to expand the band & play in clubs & pubs. That’s when I got involved. They found a drummer to augment their sax, guitar & tea chest bass line-up & then I met Maurice Chevalier in a record shop in Portobello Rd in November 1982. I’d never heard of the band but he told me he was a big fan of Charlie Christian & they played some Louis Jordan tunes & others by Count Basie & Benny Goodman. At that point I hadn’t been playing vibes long but had been in a band that used to play tunes from that era so I was invited to play at a gig in central London somewhere. They had a kind of raw energy & it was obvious something special was going on. The tea chest bass couldn’t really pitch the notes clearly & the drummer was a bit rock’n’roll but Maurice had really studied Charlie Christian & had the style off perfectly. Ray Gelato, who was the sax player, had a huge sound (& a lot of presence) but was still a beginner really. There was an amazing roughness to the whole thing but it was really exciting at the same time. I loved it & was asked to join. Little did I know what was going to happen next! In January 1983 we were asked to play (along with some other up & coming bands) at a rock night at the Institute of Contemporary Arts that was sponsored by the NME. For the first time we were seen by lots of the rock press & media. They were taken by storm & over the next two months we were asked to play on the John Peel show on Radio 1, had two slots on Capital Radio, did our first TV show & lots of our gigs were reviewed in the UK rock press. On top of that we were being interviewed in the NME, Melody Maker & kept getting our picture in Time Out. Almost immediately all our gigs were sold out, everyone wanted to book us & we were all able to turn professional by September 1983. It really happened that quickly. During that time the band personnel changed too. The tea chest bass was replaced by double bass – played by Clark Kent (until recently Ray Gelato’s right hand man). We tried several different drummers & eventually decided to stick with John Piper, a young jazz drummer that I knew from my few early gigs on the London jazz scene. At the same time Ray Gelato was furiously studying saxophone & I was learning fast too. Ray reluctantly sang more & honed his (unknown to him) natural front man skills to a fine art. The band was becoming tighter all the time. Just through gigs too, as we never rehearsed. There was also a wacky, spontaneous, humourous side to the band that meant anything could happen & used to make fans come to see us time & time again. We took Louis Jordan songs & other songs by people like Slim Gaillard (who regularly used to sit in with us) & added our own touch. It seemed to work without any great effort. For a while we could do no wrong but internal wranglings & studio phobia meant that we never released any records when we were getting the press that could possibly have given us major pop success. Although, of course, that might not have happened anyway. It certainly seemed like people were willing us on at the time though & it appeared as if there were no limits. Before we came along, all jazz got bad press in the UK & even though what we were doing wasn’t innovative we changed people’s perceptions away from the thought that all jazz was serious, introverted music or cabaret. We made it possible to have fun & listen to jazz at the same time – something that the younger generation had forgotten was possible it seemed. To record in a studio was hard for us as we loved to play live & part of the atmosphere of a gig was wrapped up in the excitement of having a captive audience. It was hard to recreate that feeling in a studio. When we did release a single, Maurice didn’t like it & made sure it was a “limited edition” of 1500 copies. Even so, we got in the NME indie charts. But we definitely lost our moment. Nevertheless, we built up a reputation as a great live band & for the next few years averaged well over 150 gigs a year travelling to most countries in Europe (some many times) & also travelling to Japan & the USA. We also released several albums & singles – discography below. Strangely, although we played jazz (admittedly from an early era), the UK jazz press never took much notice of us. Perhaps we were not serious enough, perhaps we were never forgiven for the sin of becoming popular. Things were very different in the rest of Europe. We played at the Montreux Jazz Festival, the North Sea Jazz Festival, the Stockholm Jazz Festival, Tampere Jazz Festival, Finland (where Steve Lacy said “second hand, first class” about us) & jazz festivals in Ireland (Cork), Norway, France & Belgium. Over the years the band went through a few more changes. Maurice got bored & disappeared in 1986 & the band carried on till the end of 1988 with a pianist instead. By that time, financial problems had become an issue. Despite the heavy gig schedule we weren’t making enough money & ended up owing masses of VAT. The band finally parted when we managed to pay it off. Since then sadly John Piper has died. Maurice Chevalier played in the house band of the first TV series of Vic Reeves, later became the guitarist for triphop rapper, Tricky & has since returned to his native France. Ray Gelato formed the Giants of Jive (latterly known as the Giants) & carried on where the Chevalier Brothers left off but with a brass section & a much more polished & arranged set. He’s still very popular on the European festival circuit every summer & has released several albums over the years. 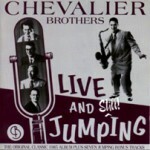 One was a “best of” that included seven tracks by the Chevalier Brothers. They wouldn’t have been my seven favourite Chevalier Brothers tracks but they certainly help to show the progress Ray has made over the years. Ray, after briefly moving to the USA, then returned to London & has since moved to Barcelona. He is still busy & releases an album most years. Clark Kent has recently left Ray Gelato’s Giants to concentrate on The Jazz Dynamos, a band he co-leads with Mark Adelman who was the Chevalier Brothers’ pianist for the final 2 years. Released 2003 on Westside Records.